Do you love Maltese puppies and want to learn more about them, their behavior, training, or adoption? Then you've come to the right place! I've done all the research for you and broken it down into 6 easy steps. I'm sure you already know that Maltese puppies need a lot of love, but do you really know how much grooming is involved, or where to find the best Maltese puppies? 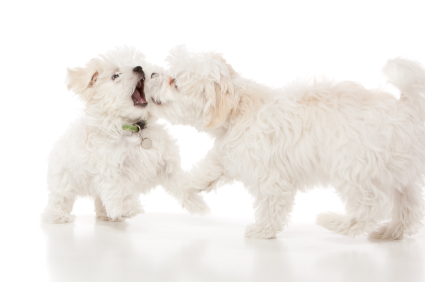 Follow these 6 easy steps below for happy, healthy Maltese puppies! Is A Maltese Puppy Right For You? 1. Is A Maltese Puppy Right For You? Is a Maltese puppy really the right dog for you? You want to make sure that this is the kind of dog you and your family will love for 15-17 years to come, through the good and the bad. Are you choosing the right breed of dog? Find out if you should consider getting toy Maltese puppies or even teacup Maltese puppies. Once you decide that you really do want a Maltese puppy and it is a good fit for you and your family, now you have to figure out where to find that perfect Maltese puppy. You can search through a list of Maltese puppies for adoption or get your new family member from a Maltese dog rescue. There are even ways to find free Maltese puppies too! There are so many things to do once you bring your Maltese puppy home. Have you decided what you will be calling your little one? Get some inspiration from our Maltese dog names list. Find out what's the best puppy food to give your tiny Maltese. I've even complied a list of the best places to get cheap dog supplies for your new addition. 4. Give the Best Maltese Puppy Care - COMING SOON! Now that you have your cute little Maltese puppy at home, it's time to start training. You'll want to learn the basics of house training a puppy first. One method that works great is crate training a puppy. Once your puppy has mastered the basics, have fun teaching him/her some cool puppy tricks that you can show off to your friends. Once you've welcomed your perfect Maltese puppy into your home and had him/her for awhile, you'll probably want to share those adorable puppy pictures and look at other really cute Maltese puppy pictures.